The Bristly dog toothbrush (also known as Brite Bite) makes it easy for dogs to brush their own teeth! When the folks at Bristly asked if I’d be interested in reviewing their innovative new dog toothbrush toy, I jumped at the chance. 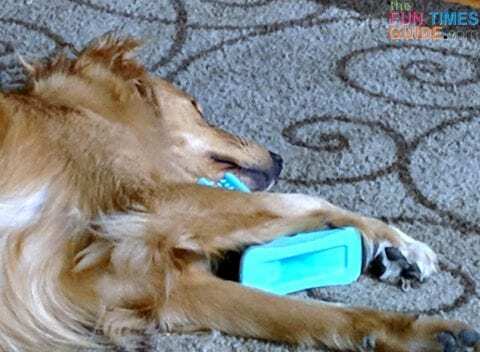 The Bristly dog toothbrush is a special chew toy that functions as a toothbrush for dogs. As most of you know, I only review products that I would actually buy for my dogs. If it’s something that I (or my dogs) don’t need or wouldn’t use, then I simply won’t review it. Who doesn’t need a little help brushing their dog’s teeth??? If there’s an easier way to do it… I’m all in! 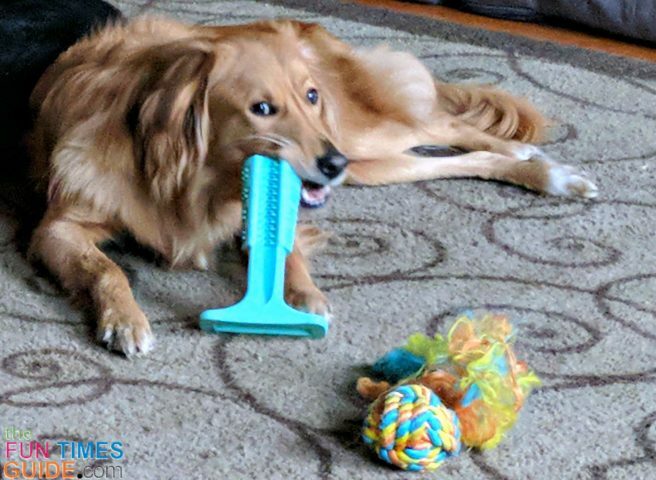 Immediately, I thought the Bristly brushing stick sounded interesting (and useful) — because dog teeth brushing is one thing that is not all that easy to do. I still do it with all 3 of my dogs. But it’s not what I’d call fun. I thought the Bristly dog toothbrush toy looked like a FUN way to brush my dog’s teeth. MY TIP: Just as humans brush their teeth daily, so should dogs. It’s the same result! If teeth are not brushed regularly… cavities appear, teeth begin to rot, bad breath sets in, and the teeth eventually fall out. To avoid that prevent tartar and plaque from building up, teeth should be brushed daily. So I set out to try the Bristly brushing stick with my dogs! We found the puppies on the side of the road a year ago when we were out motorcycling — they were around 8 weeks old. Those pups rode in my arms… in a sack… on my lap… on the back of our motorcycle while hubby led us all on a 1-hour motorcycle trip home. Today, one pup is 40 lbs and the other is 50 lbs. Our 80 lbs senior dog doesn’t play with toys, so I knew he wouldn’t be a willing participant in reviewing this chew toy. 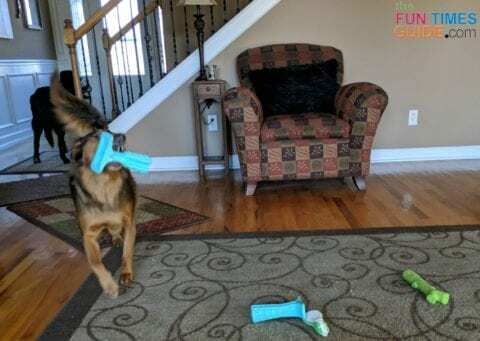 But the puppies will try any new dog toy you put in front of them — so they were my subjects for this review. Even though the Bristly brushing stick is promoted as a dog toothbrush, it’s still a dog toy in my mind. Granted, a well-functioning one with a purpose. But my dogs just think it’s a regular ‘ol chew toy and so do I. It’s basically a dog toothbrush and a dog toy in one — and my dogs are going bonkers over it! It works well for dogs of all sizes and breeds and comes in 3 sizes — Small (for dogs 5 to 25 lbs), Medium (for dogs 25 to 40 lbs), and Large (for dogs 40 to 80+ lbs). #1 – The toothpaste reservoir is such a brilliant idea. But I’ll have to find a runnier dog toothpaste — because the Enzymatic dog toothpaste that they like best is too thick to flow down into the groove, so it just stays near the top. Oooh… you know what would work great as a snack and a toothpaste inside the Bristly?… Kong Cheese Spray! It’s like Cheese Wiz for dogs. The pressurized can should give it just the boost it needs to slide down into the Bristly reservoir. MY TIP: You can also spread a thin coat of dog toothpaste along the bristles — on the outside of the brushing stick. It’s much easier to work the toothpaste into the bristles and let your dog enjoy it that way, instead of trying to pour dog toothpaste into the toothpaste reservoir. #2 – It can be tricky to clean dog toothpaste that can no longer be reached from the center of the Bristly brushing stick. My recommendation is to use a very narrow drinking straw brush, or any long & narrow nylon bristle brush. MY TIP: You don’t want to let your dog eat things that are old, dried up, or expired. Dog toothpaste comes in a tube with a screw-on cap for a reason: to keep it fresh. Its contents change when exposed to air for too long — and depending on the ingredients, it could make your dog sick. So be sure to clean the Bristly brushing stick within hours of putting dog toothpaste (or other moist dog treats) inside it. I’m 100% positive this dog toothbrush toy is going to last my dogs much longer than 4 weeks. And if not — if the bristles should dull or fall off after that time — I’m 100% positive that I’m not going to spend money every 4 weeks to buy a new Bristly to replace a worn out one. Even if I treat it solely as a ‘dog toothbrush’ (and not as a ‘dog chew toy’) — giving it to my dog daily for only 5 minutes to brush their teeth, then me cleaning it & putting it away until the next day — it will surely last much longer than just 4 weeks! Perhaps my dogs simply haven’t used it long enough or hard enough to show some serious wear yet. I’ll post updates here at various time intervals — after ‘months’ of use. 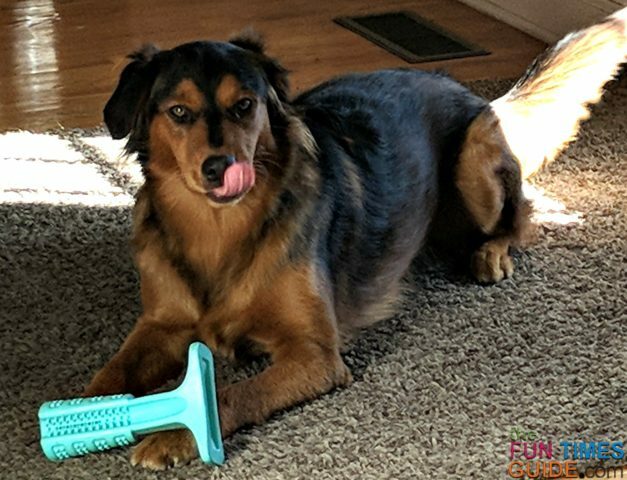 As a lifelong dog owner, I can attest to the fact that this DIY dog toothbrush saves me a lot of time brushing my dogs’ teeth. That’s a good thing, because it’s not a chore that I — or they — enjoy very much. Because I started brushing their teeth myself when they first entered our home as tiny puppies, they’re actually used to the process and they don’t wriggle too much or squirm to get away — like most dogs do. I think they’re fine with having their teeth brushed because they like the flavors of the dog-friendly toothpaste so much! Thankfully, now my dogs are able to clean their teeth themselves here & there while chewing on the Bristly dog toothbrush toy — and I have to spend much less time doing one-on-one teeth brushing with them. It’s a win-win for us all! 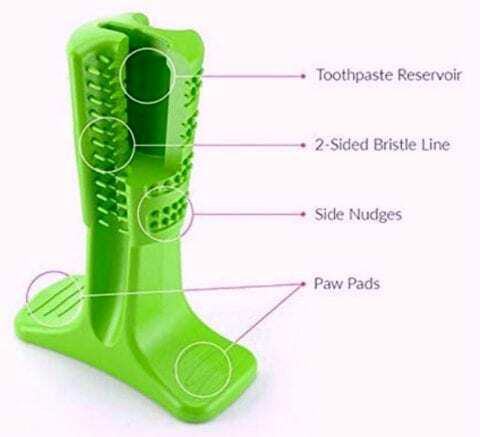 MY TIP: To ensure that your dog continues to want to brush their teeth regularly on their own with the Bristly dog toothbrush toy, my recommendation is to either: 1) give it to your dog for only 5 minutes each day (as Bristly recommends) OR 2) leave it out for your dog to chew on when they want, then remove the Bristly from your dog’s play area for several days at a time before reintroducing it again (like I do). 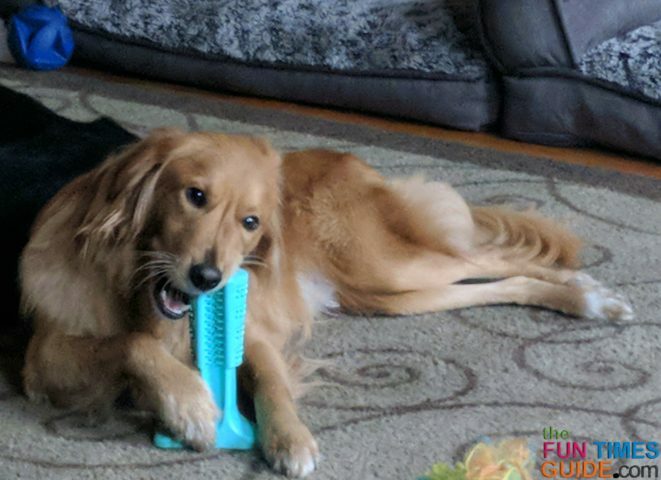 Both ways will prevent your dog from growing bored with it, and they’ll be excited each time they get to chew on the Bristly brushing stick! It’s the same strategy parents use with children’s toys. The idea is to rotate kids’ toys, so they’re constantly excited by “new” playthings instead of feeling bored by seeing the exact same toys all the time. Here it is 4 months later, and my dogs still love their Bristly toothbrush toys! I put dog-friendly toothpaste inside them once a week — at which point, both pups will eagerly chew and gnaw on the Bristly toy for up to an hour. The rest of the week, I generally keep the Bristly out of reach so it will always be a “special” toy for them to chew on. Occasionally, I forget to put it out of their reach and I’ll find one or both of them chewing on their Bristly toys for 10 to 15 minutes at a time. In case you’re wondering which one, I started using this one by Oral-B — but then I switched to this one from Oral-B because the brush head is smaller and fits inside a dog’s mouth better. They do sell electric toothbrushes specifically designed for pets as well.